America is the result of a journey and a daydream. 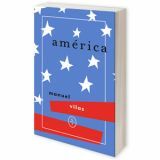 A narrative awed by the immensity and vastness of a nation, the United States, which is like a whole planet that encompasses everything. America is the representation of a mythical space: contradictory, beautiful, and always excessive. Manuel Vila’s journey through that space is a sentimental and hallucinatory passage through cities that nobody goes to or through others that everyone goes to on infinite highways populated by phantom motels. And it is also a voyage through memory that includes rock stars, writers, artists, Pop icons, old remembered glories, and The Simpsons as a metaphor for the new American Way of Life.